Soldier Ride events are carefully planned to ensure warriors are accommodated no matter where they are in their recoveries from visible and invisible wounds. You’ve probably seen it on TV – a group of veterans on bicycles wearing matching gear, as people filling sidewalks wave American flags and cheer as they ride past. 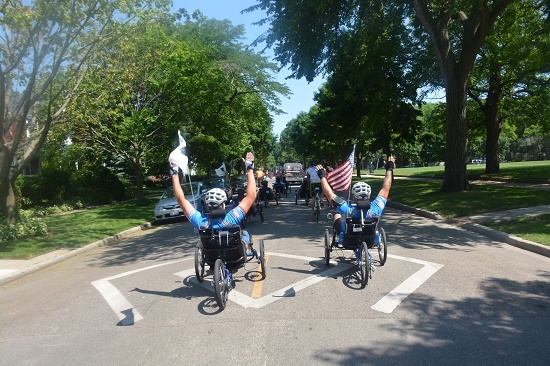 What you may not know is that Wounded Warrior Project® (WWP) Soldier Ride® isn’t just a nice show of appreciation for our nation’s injured veterans; it’s about getting warriors on a long-term path to recovery. For some warriors, Soldier Ride is the first WWP event they will attend. For others, it might even be the first time they venture out of their homes to connect with the community since being wounded. Many warriors face similar challenges with isolation when transitioning to civilian life; it’s one of the most significant struggles they deal with after serving their country. Events like this offer a chance for warriors to bond with one another, learn they are not alone, and rekindle bonds similar to those formed in the military. And people in communities where the rides take place have a chance to see our wounded warriors firsthand and offer whatever support they can. During Soldier Ride, warriors will spend three days and 30 to 40 miles on their bicycles, but they’ll also enjoy some incredible experiences off their bicycles. These include a variety of team-building activities where warriors can connect with one another, such as tours of famous local landmarks, sporting events, bowling, kayaking, and physical health and wellness training exercises. WWP also ensures warriors are aware of the support that continues when Soldier Ride comes to an end. Participating riders will learn about WWP’s free, life-saving programs and services that are available to wounded veterans, their caregivers, and their families. To learn more about Soldier Ride, including how to register, check out the Soldier Ride web page. To learn more about how WWP’s other programs and services connect, serve, and empower wounded warriors, visit http://newsroom.woundedwarriorproject.org/.